BruneiAssociation-A Part of the World No Longer Apart"Study the past if you would define the future. ""The Zopfan declaration: That Indonesia, Malaysia, The Philippines, Singapore and Thailand are determined to exert initially necessary efforts to secure the recognition of, and respect for South East Asia. ""The existing special treaty relations between The United Kingdom and the state if Brunei, which are inconsistent with full international responsibility as a sovereign and independent state, shall terminate with effect from five years from 31 December 1978. ""The top keeps spinning and or people watch it closely and judge the way we play it. ""Total concentration. Balance. Perseverance. A southeast Asian way of life! ""Chiang Mai Initiative of 2001: Brunei, Cambodia, Indonesia, Laos, Malaysia, Myanmar, Philippines, Singapore, Thailand, Vietnam, japan, People's republic of China, Republic of Korea and observer: Papua New Guinea." 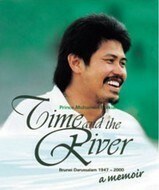 A combination memoir and 20th-century history of Brunei, written by the Sultan's brother, who is also Brunei's Foreign Minister. (Wikipedia says his full name is Duli Yang Teramat Mulia Paduka Seri Pengiran Perdana Wazir Sahibul Himmah Wal-Waqar Pengiran Muda Mohamed Bolkiah, but he just goes by the last two.) Bolkiah's pride in his country is obvious and I learned a lot about Brunei from the book, when I had known little before -- just that it was tiny, it had oil wealth and it was ruled by a sultan. He writes clearly and plainly about Brunei's trials, tribulations and triumphs, and also about his own experiences growing up as the prince of what was then a deeply impoverished country ravaged by World War II and fighting for its own existence.The second half of the book, where Bolkiah talked about his job as Foreign Minister, was much less interesting to me. I think it got very repetitive, particularly the photographs, which were all just monotonous images of Bolkiah shaking hands and sitting down with various world leaders. It was still pretty impressive, though, and left me feeling glad I wasn't royalty. Too much responsibility.